When you think of New York, it’s natural to think of New York City. I sometimes feel too overwhelmed there with chaos and bad smells. Consider Upstate New York instead, which includes the caves of eastern New York, the Adirondack Mountains, Syracuse, Rochester, and in western New York, Niagara Falls, which has American and Canadian halves. There are plenty of outdoorsy, interactive adventures to find that bond you with nature or teach you about life. I visited New York to escape “touristy” norms, and find the classy, truly unique oddities of the region, writing 24 articles. These destinations are true gems. 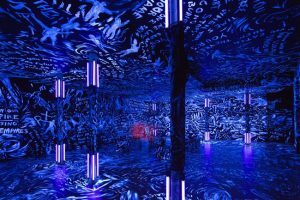 Driving to eastern New York from Boston, you’ll find the Massachusetts Museum of Contemporary Art, or Mass MOCA (5 stars) in the northwest part of Massachusetts. On their immense campus, you’ll find works of art so large that you can literally walk inside and get lost in them, pieces made purely from light, and pieces formed from darkness. New England has no natural caves; what you may see advertised as “caves” are actually jumbles of rock, boulders leaning against one another that shelter small pockets in the ground. So cross the border and find the closest real caves to Boston, in eastern New York. Most of the caves in the region, such as Clarksville Cave, are privately owned, with access given only to experienced spelunkers — and I could find no cave experts guides offering tours. However, I recommend Howe Caverns (5 stars PLUS), which has been sanitized with walkways for easy touring, includes an underground boat ride, and comes with an adventure park including a ropes course and zipline. 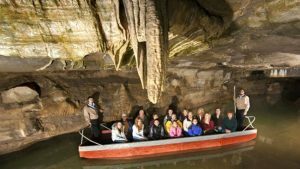 In the same day, visit its neighbor Secret Caverns (5 stars), which doesn’t pamper you as much, but has creative moxie and a 100-foot underground waterfall. Visit the next door Iroquois Indian Museum, too. 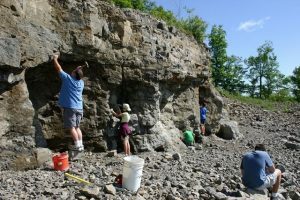 Starting to head west, visit the Herkimer Diamond Mines (5 stars), where you learn about science, search for gemstones in a real mine, and take them home with you. At their luxury campground, Herkimer Diamond KOA (5 stars PLUS), discover “glamping” (glamorous camping) with edutainment cabins themed on the fishing, diamonds, fossils, green energy, and stargazing of the Utica region. Their restaurant, The Miners’ Table (5 stars), has a brick oven built from gemstone-riddled rocks from the mine, and sources its food locally. It’s the perfect combination of upscale but welcoming, not snooty. 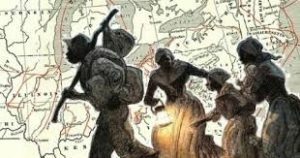 Also in north central New York, find the Harriet Tubman House (4.5 stars), the historic former home of the Underground Railroad pioneer and Civil War spy. Having been to many boring historic home tours, I was delighted to take this so accessible and interesting free tour. It helps you feel history’s importance and relevance today, brave with the facts but without being preachy. 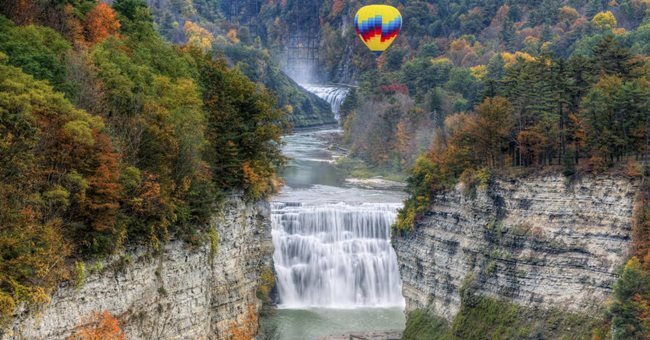 Continuing out west towards Buffalo and Niagara Falls, spend a day or two in north central New York at Letchworth State Park (5 stars), a miniature alternative to the Grand Canyon that is far easier to access. It’s a 17-mile gorge cut through rock by the Genesee River, with striking beauty in the waterfalls and cliff rock walls, with amenities that go far beyond canoeing, hiking, and swimming. You can take a hot air balloon ride, stay in a luxury cabin, and eat at an upscale restaurant, all in the center of the park’s beauty. We also went whitewater rafting through the Letchworth gorge with Adventure Calls Outfitters (4.5 stars), an easy ride (it’s only a Class II river) where you stop at a waterfall for lunch and can jump in to swim. 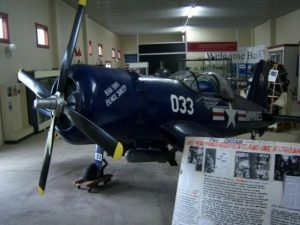 Nearby, visit the National Warplane Museum (4.5 stars), a museum of World War II and Korean War era aircraft, driven by volunteer spirit that is infectious. You can climb into the planes on the ground, or take a trip into the air! Finally, arrive at Niagara Falls in western New York, at the border with Canada. I keep hearing that the Canadian side is better, but really they are just very different, one with natural beauty and one a man-made fun park. You come to Niagara Falls to bond with nature and experience the raw power of the falls. The Canadian side has little parkland, so go to the American side, to Niagara Falls State Park (5 stars PLUS), to see the massive waterfalls from the overlooks and parkland above and from the Maid of the Mist boat ride. (You do not need to also ride the Hornblower Niagara Cruises on the Canadian side, which seems to run the same river route.) Then, at Cave of the Winds, walk down stairs through the mist of the waterfall, so close that you can touch the water! You don’t really go to Niagara Falls to visit a theme park, but on the American side, you can see The Aquarium of Niagara and Old Fort Niagara. There’s much more on the Canadian side. They’ve got an entire tourist district, a region of upscale, larger-than-life attractions as you’d find in Times Square or Universal Studios CityWalk. With an American passport, it was no trouble crossing the border, a minute’s stop without even leaving our car. 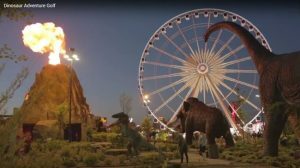 Start at Clifton Hill (5 stars), which is the fun park of Niagara Falls, Canada, featuring a Ferris wheel, dinosaur mini-golf with a flaming volcano, an interactive movie theaters where the entire audience gets laser tag guns to shoot zombies, a mass videogame, and more. Find Halloween any time of the year at the Nightmares Fear Factory (4 stars), a haunted house where you wander and scream in complete darkness. At the Niagara Freefall & Interactive Center (4 stars), you can skydive without leaving their ground, at their indoor wind tunnel, plus ride a mechanical bull and play a soft foam form of paintball. Eat lunch or an early dinner at Skylon Tower (5 stars), which offers the highest dining view of Niagara Falls. You can also get dinner at the Greg Frewin Magic Theater (5 stars), which has world class illusions including disappearing and reappearing tigers that you can pet after the show. 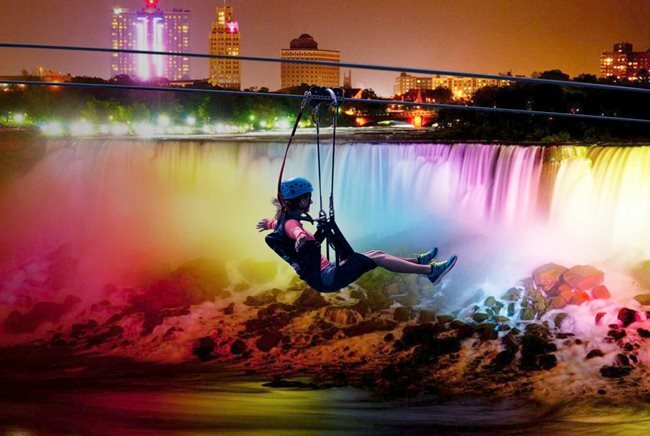 Best of all, ride Wildplay’s Mistrider Zipline to the Falls (5 stars PLUS), a zipline that takes you racing alongside Niagara Falls! On your way back to New England, drive up and into the Adirondack Mountains. 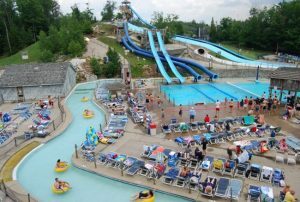 There you’ll find Water Safari Resort (4.5 stars), which has hotels, a campground, a fun park, and New York’s biggest and best water theme park. 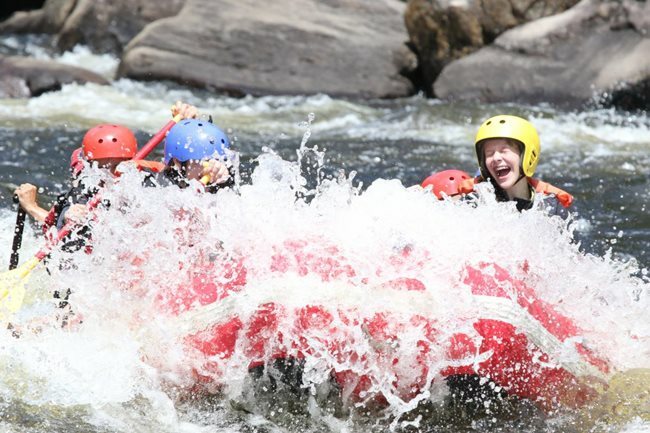 Brave the Hudson River with a whitewater rafting company, either with the Adirondac Rafting Company (4 stars) or with Adirondack River Outfitters (5 stars PLUS). Whitewater rafting the Class III (and occasionally IV) rapids is easy to do and makes you look like a superstar in photos. Guides are high energy, make you feel safe, and there’s no better way to experience a rushing river. 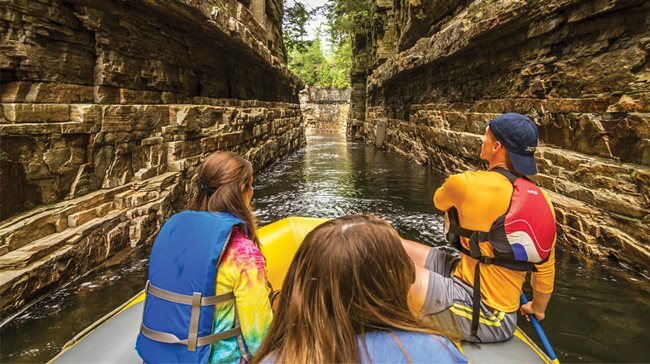 Higher in the mountains, Ausable Chasm (5 stars PLUS) is a 2-mile river-cut gorge that is filled with bucket list activities and stunning views. Along its rock wall cliffs, hike, rock climb, rappel, or trek a ropes course, 100 feet over the water. Or at water level, float along on an inflatable tube or take a guided raft tour. On the way back to New England, visit Fort Ticonderoga (5 stars), one of America’s most historically important forts. You’ll learn about the six battles that happened there, tour the wonderfully fragrant gardens, take a lake boat ride, get lost in the corn maze, go hiking, eat at their Americana cafe, or attend a creative event where they fire muskets and cannon. In the same town, perhaps New York’s strangest destination is The Star Trek Original Series Set Tour (4 stars). It’s a recreation, made lovingly by fans, of the original TV shooting set where the first Star Trek program was made. You tour it, take all the photos you like, and they have events with celebrities including William Shatner visiting this December. Elsewhere in Upstate New York, find these destinations that we were unable to visit: Lockport Cave and Underground Boat Ride, which also has a zipline, Erie Canal Cruises, Natural Bridges and Caves, Watkins Glen State Park, The Corning Museum of Glass, the Seneca Iroquois National Museum, Fort Ontario, Hidden Valley Animal Adventure, Whirlpool Jet Boat Tours, Yaddo Gardens, Bird Kingdom, Susan B. Anthony Childhood Home, Women’s Rights National Historical Park, Bristol Mountain Aerial Adventures, Roseland Waterpark, Roseland Wake Park, Niagara Jet Adventures, Adirondack Animal Land, Painted Pony Rodeo, the Glenn Curtiss Aviation Museum, Extreme Hydroflight, which is flyboarding, and Genesse Country Village & Museum, a living history museum with costumed re-enactors. New England has even more quirky, creative, and unusual destinations, but I was so pleased to find that Upstate New York is well worth a week’s visit. You will feed your mind at its living history and parkland museums, feed your soul through its natural beauty, and live life to the fullest with its fun parks and wilderness adventures. Find more travel reviews at eventsinsider.com/travel/.